US President Donald Trump wrote in a tweet that his second meeting with North Korea’s Kim Jong-un would be held in Hanoi on February 27-28. Will this summit help get a solution to the problem of Pyongyang’s nuclear missile program off the ground? Kim said he would not build, test, use or proliferate nuclear weapons, and has taken practical measures to confirm his intention. Pyongyang has not held a nuclear test for about 18 months and has not launched a missile for over a year. The test site at Punggye-ri has been taken down. North Korea said it would close down the Tongchang-ri engine test site if the United States makes a reciprocal move, and could also shut down the Yongbyon reactor. Pyongyang has the right to expect Washington to respond to these moves by lifting some of the sanctions that have been imposed on North Korea over its nuclear missile program, and by suspending US-South Korean military exercises, which Pyongyang regards, with good reason, as preparations for an invasion of North Korea. However, Washington argues that any concessions to Pyongyang are only possible if North Korea abandons its nuclear missile program fully, immediately and irreversibly. However, Kim Jong-un’s goal is not the unilateral denuclearization of North Korea, but the denuclearization of the Korean Peninsula, as this is stipulated in the Trump-Kim statement adopted at their summit in Singapore. Pyongyang wants proof of the withdrawal of US tactical nuclear weapons from South Korea, as President George H.W. Bush pledged to do in 1991, and that the peninsula will remain nuclear weapons-free. North Korea also wants the United States to keep its nuclear-armed warships away from South Korean ports and its strategic bombers away from North Korea. Considering US demands for large-scale verification inspections at North Korea’s nuclear facilities, Pyongyang wants to be able to verify the absence of nuclear weapons in South Korea, including at US military bases. Less than a week is left before the second summit meeting between Donald Trump and Kim Jong-un that is due to take place in Hanoi on February 27-28. What will be its agenda and prospects? Summit meetings are never long, and hence major problems cannot be settled unless solutions are thoroughly prepared and discussed well in advance. For example, Soviet and American experts held talks for a very long time before the signing of the ABM and strategic arms reduction treaties in the 1970s and 1980s. However, no such talks were held between the United States and North Korea before last year’s summit in Singapore or the upcoming meeting in Hanoi. It looks as if Trump only needs his meetings with Kim Jong-un primarily for domestic publicity. Back in the fall of 2017 he threatened to take “physical action” against North Korea, pushing US-North Korea relations to the brink of war, which could result in Pyongyang launching nuclear missiles at targets in the United States. The Singapore summit held in June 2018 removed that threat, and the television presentation of President Trump, who came, saw and conquered, improved the Republicans’ rating ahead of the November 2018 elections to Congress. The planned summit in Hanoi should draw public attention in the United States and other countries away from the government shutdown, the unpopular decision to withdraw from Syria, and the scandal over the US-Mexican border fence. The atmosphere at the Hanoi summit will depend on the sides’ standing at home. North Koreans believe that “Marshal Kim,” who has forced the president of the world’s main imperialist power to talk as equals, has excelled his father and grandfather and will remain the national leader for a long time. At the same time, many people in the United States and beyond doubt that Trump can be re-elected in 2020, considering his confrontation with Congress and the sharp criticism of his every move by the Democrats and even some Republicans. In this context, Kim should not sign any agreements with the United States now because Trump’s potential successor could reverse any commitments Trump makes, just as Trump is now withdrawing from the treaties signed by his predecessors. 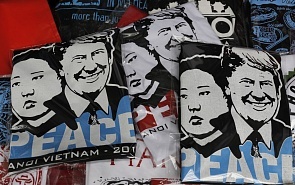 Trump will need to produce more in Hanoi than the positive TV footage of shaking hands and exchanging smiles with Kim, as they did in Singapore. With the 2020 presidential race right around the corner, Trump needs an ambitious result from the talks on the North Korean nuclear missile problem. Moreover, this result must be acceptable not only to American public opinion, but also to the other parties involved, including South Korea, China, Russia and Japan. However, this is highly unlikely.